Not only do they lift us up when we're down and celebrate when we're successful, they're essentially an extension of our family (and sometimes they become our actual family). 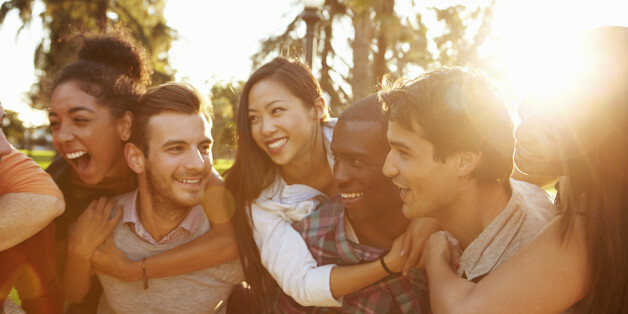 And while we can wax poetic on how our social relationships are crucial to our everyday life, there's also real science showing how our friendships actually benefit our well-being on a physical and emotional level. As if you needed any more reasons to be grateful for your BFF, below are five ways your social bonds can have a positive impact on your health and happiness. After all, what are friends for? Feeling the weight of the world on your shoulders? Your BFF can help. According to a 2011 study, spending time with your friends can help decrease your stress. In a culture where almost 50 percent of us have experienced stressful events in the past year, our friends can be a much-needed rock. They increase your sense of belonging. Connecting to others not only makes you more compassionate, but building friendships also gives you a greater sense of belonging and meaning. According to Karyn Hall, Ph.D., director of the Dialectical Behavior Therapy Center in Houston, Texas, friends can also be a gateway to feeling a part of something bigger. "A sense of belonging to a greater community improves your motivation, health and happiness," she wrote in a recent Psychology Today blog. "When you see your connection to others, you know that all people struggle and have difficult times. You are not alone. There is comfort in that knowledge." They help you battle health issues. Having a friend by your side can help big challenges seem smaller -- and our health is no exception. Research has shown that strong social support systems have a positive effect when you're battling a disease, cut your risk for dementia and also alleviate depression. They can improve your mood. They can help you live longer. Your friends may have an immediate impact on your life right now, but a 2009 study found that they can also help you later on. Our social bonds have been scientifically proven to help us live longer, possibly due in part to the healthy influences they have on our daily behaviors. Our friends can help us stop smoking, eat better and dodge loneliness later in life -- all key components for longevity. Not a bad reason to be thankful for your pals.